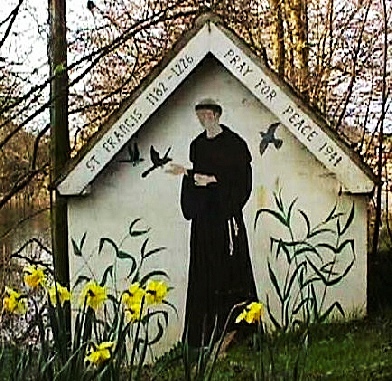 This mural was painted on to the wall of a pump house next to a fishing pond in a secluded lane in Kesgrave. Mr Patrick Jolly, of Grange Farm, Kesgrave, was the family that built the original pumphouse. During the war their home, Bracken Hall, near a roundabout on the road to Ipswich from Martlesham, had been used as a recovery home for U.S. Army Air Force airmen. Patrick’s Great Aunt Mrs L. Rope, originally thought of the mural in memory of Her Husband, Squadron Leader Michael Rope, who was tragically killed in the R101 Airship Disaster which happened on Sunday 5th October 1930. She asked an American serviceman from the 356th Fighter Group at Martlesham, Sergeant Irving Smith to paint St. Francis – as an Apostle for peace. Smith, recovering from Injuries, would have remembered so many fellow Americans who had died whilst serving at Martlesham Heath and elsewhere. He was a keen Catholic and former Commercial artist from Washington in the USA. He relished the commission, and produced a profound and very simple image, in just a couple of weeks. It has understated colouring, the monk being surrounded by waving reeds and flocks of birds. It was a far cry from the work that Irving usually did – painting roundels and sharks teeth etc on American aircraft.